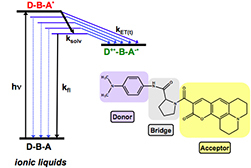 One set of questions concerns processes occurring on very short time scales, including time-dependent yields, properties, geminate recombination, and reactivity of primary radiation products in non-aqueous solvents and ionic liquids. A second set examines thefundamental science of charges and excited states in conjugated polymers and ionic liquids. Work on conjugated polymers indicates that these molecules can transport charges rapidly over very long distances: the molecules might be called semiconducting "molecular wires." A third set deals with reactivity of molecular and radical transients, where pulse radiolysis provides the most convenient or the only method to rapidly generate these species. Work in this area includes the reactivity of environmentally and biologically important nitrogen-oxygen species whose chemistry is poorly understood, and redox, proton, and hydrogen atom transfer reactions that relate to solar fuel generation. This program includes the Accelerator Center for Energy Research (ACER), which develops and operates advanced instrumentation for the application of radiolysis techniques. The principal tool for this research is the Laser Electron Accelerator Facility (LEAF), which combines short, ~10ps, pulses of electrons and 0.1ps laser light to produce, excite, and examine transient species with high time resolution. 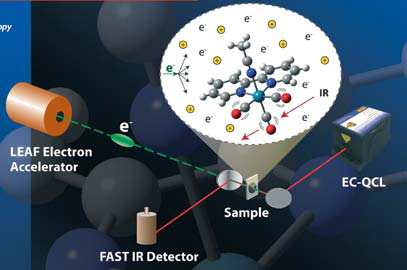 ACER also includes the 2 MeV electron Van de Graaff, which is a sensitive and adaptable instrument for radiolytic kinetics work on longer time scales, and a Co-60 source that is used for product studies and detection of radical intermediates by scavenging.